Steven Davies celebrated his 21st first-class hundred while Liam Plunkett claimed the prized wicket of Kumar Sangakkara in a hard-fought first day at Headingley. Surrey’s Gareth Batty opted to have a toss so he and Andrew Gale headed to the middle to be old-fashioned; the plan worked for the visiting captain as he won the coin-flip and opted to bat. The morning session offered interesting viewing for those who avidly follow the County Championship circuit as Yorkshire were thrown the ball for the opening morning much like they did at Trent Bridge last week. Only this time, they offered up something resembling a decent opening bowling attack. The hosts limited Surrey to just three runs from the first seven overs while openers Arun Harinath and Rory Burns returned a few chances for Yorkshire. By the time Harinath was caught by Gary Ballance on 12 off the bowling of Plunkett, he was already dropped three times – the most recent time the ball before he was finally dismissed. Burns fell a little before his opening partner Harinath but also for just 12 runs, meaning Yorkshire had removed both openers for very few runs but the wickets brought Sangakkara and centurion-to-be Davies to the crease. In response to his second delivery, Sangakkara dismissed the ball with venom to the boundary and thus marked the first of his 13 fours to be scored. The Sri Lankan’s time at the crease came to an end shortly after the lunch break and immediately after a run-out chance whilst taking his 73rd run of the day. It was a good, powerful throw by David Willey which ended in a direct hit and impassioned appeal by bowler Jack Brooks but the umpire disagreed and Sangakkara survived; until the next ball. Plunkett’s first delivery of the next over prompted him to attempt a shot the caused the ball to arc up and second slipper Alex Lees to jump into the air and grasp onto the ball. The Yorkshiremen will have been happy to see the back of the perpetually elegant Sri Lankan, even if the crowd felt it to be a little bitter-sweet. The next man to go was Jason Roy, whose wicket prompted controversy. He scored just one run before Brooks got him to edge one to fellow England man Joe Root at third slip. A diving, one-handed catch warranted a near half-marathon run by Brooks as part of the celebration, all the while Roy remained firmly in front of the stumps questioning whether there was a bump ball in the process. With the vocal Yorkshire faithfuls advising him where he should be heading, the hesitation was short-lived and he walked off the field leaving Davies to be joined by Ben Foakes. This pair played through the ‘tails-up’ danger period and settled into something of a rhythm with Davies bringing up his century just before the tea break. Despite this being his first Championship century for a year, Davies played well striking the ball with confidence to find the boundary on 20 occasions in his 163 ball innings. The tea break offered no respite for the Yorkshire bowlers who were now looking like they were toiling through the overs. It was the reliable work-horse-esque bowler Steve Patterson who, more than half an hour into the evening session, began to probe at Davies and got his just reward when one delivery was chipped innocently to short cover and the waiting hands of Plunkett. Davies’ innings closed on 117. He didn’t have to wait long for the next wicket either as he removed Foakes in his next over. 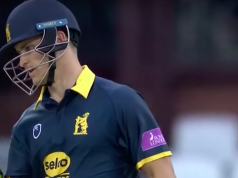 The next juncture in the match was to be the new ball, at which point Brooks and Willey took over the bowling and secured the final four wickets – Willey taking two in two – to close Surrey’s innings out for 330 runs. Two overs needed to be faced by the Yorkshire openers and Adam Lyth dispatched the first delivery to the boundary for four to make it perfectly clear what his intentions were. Yorkshire finished the day without loss having added 15 runs, trailing Surrey by 315.